Closing-in on $12K, New Reach Goals revealed! Looks like we're through the long holiday weekend and closing in on our funding. Sitting at 90% of goal with 5 days to go. We've made some big changes to our Reach Goals to try and increase the momentum and generate some buzz. We've added 6 additional items to your list of choices for a total of 12. 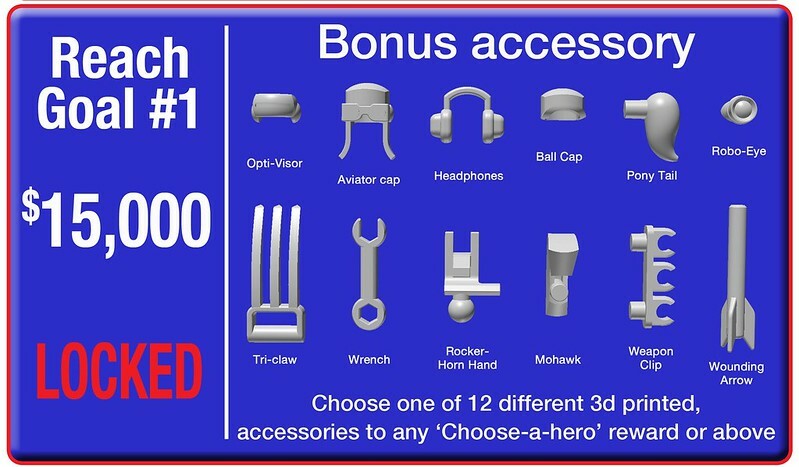 If we reach $15K every backer at or above the $26 reward level will get one of the 3d printed bonus accessories shown, Opti-visor goggles, leather aviator cap, headphones, ball cap, New Moli pony tail, robot eye lens, tri-claw weapon, wrench, rocker hand, mohawk, back-attached weapon clip, and a wounding arrow (plugs into your warrior for that extra tough look). You can get a closer look at the accessories in the 3d viewer below (there's a full-screen option on the viewer to help you see better). All bonus items will be molded in white or in a matching color to one of your other accessory sets. Not only will this unlock a new figure color option, but as in the prior two bonus colors, it unlocks a new figure kit option. We've had a lot of questions, speculation, threats and attempted bribery pertaining to the mystery figure option that opens if we hit $17,500. 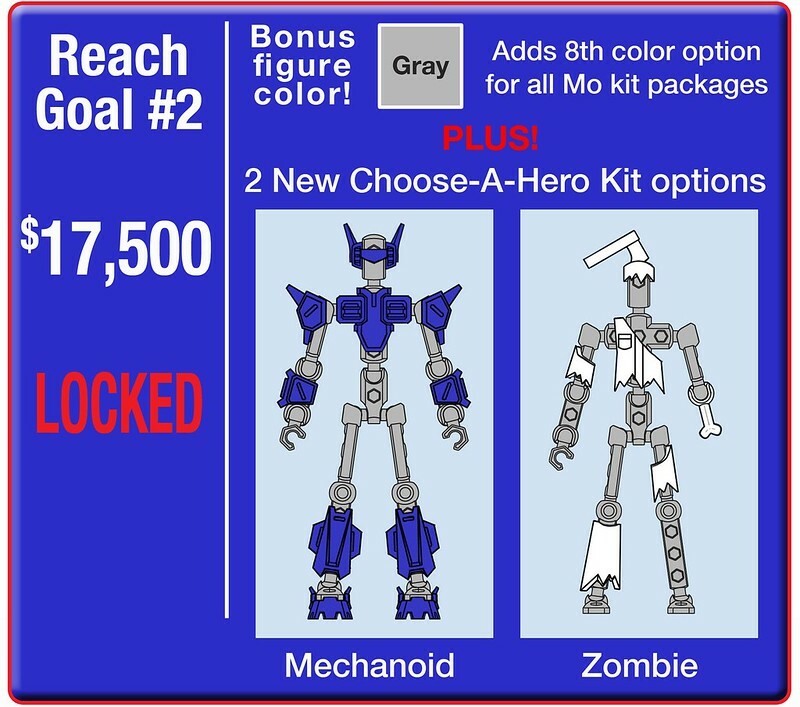 $20,000 Reach Goal- Not just parts, A Whole Kit! 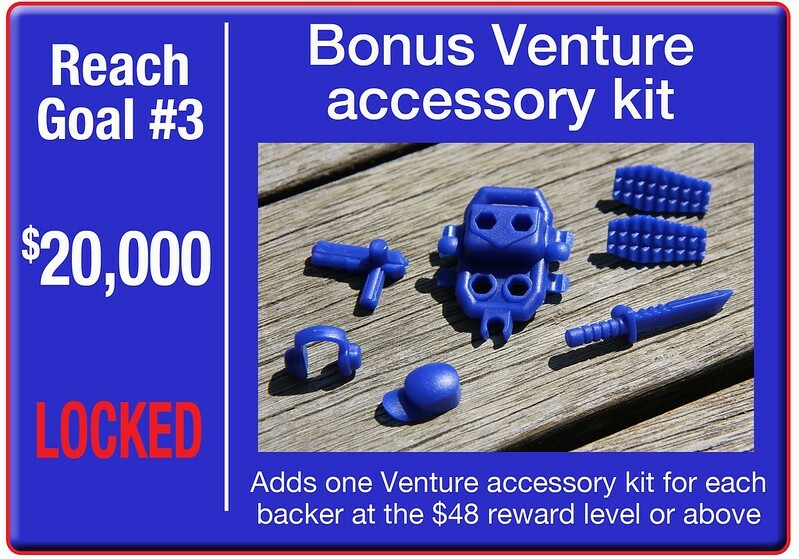 We wanted to give a real incentive to try and get to $20K, so if we hit it, we're going to give a whole accessory kit to any backer at the $48 reward level or higher. The Venture Kit is our first plastic-molded accessory kit and one that we'll be building new expansion accessories for in the future. It comes in two color choices- blue or black. This isn't all. We're working on some more freebies to throw into the mix once we hit $12K. More on those later. As always, if you have any questions, please let us know. Lets make these last 5 days REALLY BIG! We'd love to give all these goodies away! This rules! Gray sounds sweet and I have to say that bone arm looks fun. Hmm, I wonder how the new robo version modibot stands up to my Soul of Chogoken Mazinger.